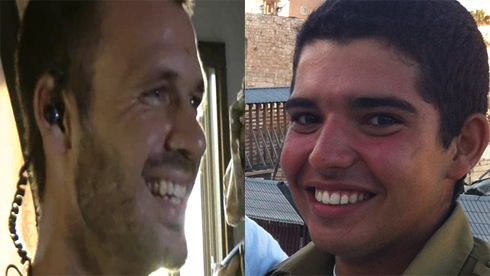 August 1, 2014 - IDF Spokesperson's Unit released the names of the two soldiers killed Monday in Gaza – Givati recon company commander, Major Benaya Sarel, and Staff Sergeant Liel Gidoni. The two Israeli combat troops died in the incident in which Second Lieutanant Hadar Goldin was likely abducted, during the ceasefire broken by Hamas. Sarel, a 26-year-old from Kiryat Arba, was promoted posthumously. Gidoni (20) will br brought to rest Sunday at 5 pm in the military cemetery on Mount Herzl. Reporters had embedded Wednesday with a Givati Brigade commander, Col. Ofer Winter, who had asked his subordinate Sarel, "Are you ready for an expansion of the fighting?" Sarel, whose wedding date was two weeks away, embarrassingly answered: "We haven't even started, we are fresh." The reconnaissance mission had been undertaken during a humanitarian ceasefire, similar to the temporary truce during which the soldiers were killed Friday after terrorists emerged from a tunnel in Rafah. In the documented recon mission, Sarel spoke about his experiences fighting terrorists in Gaza: "He who abandons his weapon is not a fighter. It goes against the image they are trying to create of Shahids who fight to the death. In the end you get to places and you see them dropping their equipment." Maj. Sarel had collected all the fighting measures he found abandoned in one home in Rafah – powerful explosive devices, Kalashnikov rifles, communication devices, digging equipment, and grenades. Sarel told a reporter that his wedding was in two weeks but he had not had the time to buy a suit. "He was also injured by shrapnel in a firefight, but he won't say a word about that," said once NCO about Sarel. "My wife is making all the arrangements. She ran the office of a Givati Brigade commander, so she supports and understands the importance of the mission," said Sarel.